Dagannoth Rex is one of three Dagannoth Kings which reside in the Waterbirth Island dungeon. His primary attack style is melee, however, the other two Dagannoth Kings – Prime and Supreme – use Ranged and Magic respectively. For this reason, if you’re not careful within the dungeon, you may be under threat from all three combat styles at once. There are two common tactics used at the Dagannoth Kings. Rex is the only Dagannoth King which you can comfortably solo without having to deal with the other Dagannoth Kings. 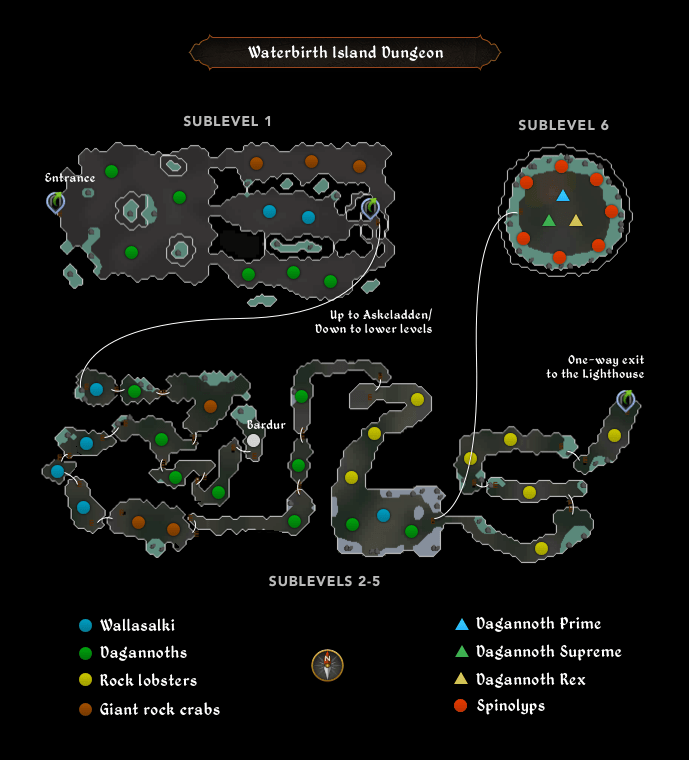 If you are looking for info on the tribrid method, you should check out our guides on Dagganoth Prime and Dagannoth Supreme. The solo mage method at Dagannoth Rex requires you to stay in one specific corner of the dungeon in order to avoid Dagannoth Prime and Dagannoth Supreme. When Dagannoth Rex spawns, use your trident on long-ranged mode to lure Rex to your corner of the dungeon. When he gets closer, there is a specific corner of the dungeon in which you can trap Rex (view here) so that he cannot attack you. Once Rex is trapped, you can easily just kill him with magic without taking any damage. When Rex is dead, you can either use Guthans or Blood spells to heal up on the minions around you. The Imbued Heart will speed up your kills but you can easily manage without it.